I have been enthralled with the story of Anastasia since I was a little girl. I still am. 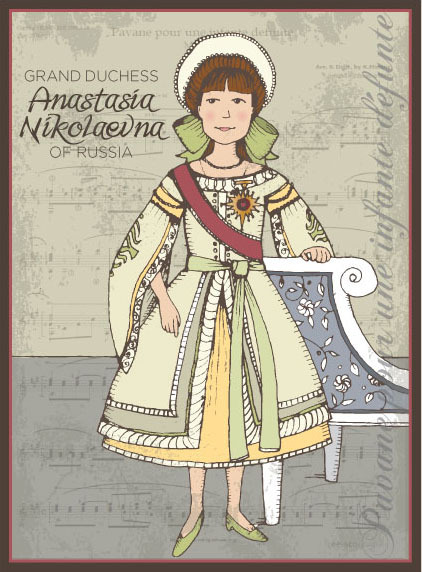 Anastasia Romanov was the most mischievous of Nicholas’ daughters. Their family was murdered in 1918 by forces of the Bolshevik secret police. It was believed that Anastasia and Alexei escaped the slaughter because their bodies were not found with the family- sparking a worldwide phenomenon of various loons pretending to be the heir to the throne. It was only in 2009, thanks to DNA, they were finally accounted for- they did, in fact, die with the family but were buried in a separate grave. So tragic. I’ve overlapped a hint of Ravel’s Pavane Pour Une Infante Défunte (Pavane for a Dead Princess.) I love playing that one on the piano- some of the most beautiful music ever written.